The City of Encinitas continues to enjoy financial prosperity as a result of disciplined budgeting, low-debt, rising land values and modest goals. We live within our means, covering all the city’s priorities – like law enforcement, park maintenance and street paving – while judiciously allocating funds for larger capital infrastructure projects. Last week we started the two-year budgeting process, while also mapping a six-year plan. The city’s revenue is increasing, mainly from rising property and sales taxes. The assessed value of our city’s land is $14.4 billion, with home prices continuing to rise. The city’s property tax revenue went from $40.3 million in 2015/16 to $42 million in 2016/17, and is predicted to be $43.7 million in 2017/18 and $45.8 million in 2018/19. While property taxes provide 60% of our general fund revenue, sales taxes are the second-largest source of city income, providing 20% of the general fund. When someone buys goods in the city, a tax of 7.75% is charged, with 1% of that coming back to the City of Encinitas. Sales tax income is estimated to rise from $12.8 million in 2016/17 to $13.2 million in 2017/18. Thankfully, we have a low debt-to-income ratio, which reflects our annual payment on city debt, or bonds, compared to our revenue. Our bonded debt ratio is 5.7%, and anything under 10% is considered excellent. Although we have the capacity to take on more debt, at this time we’re not actively discussing it. 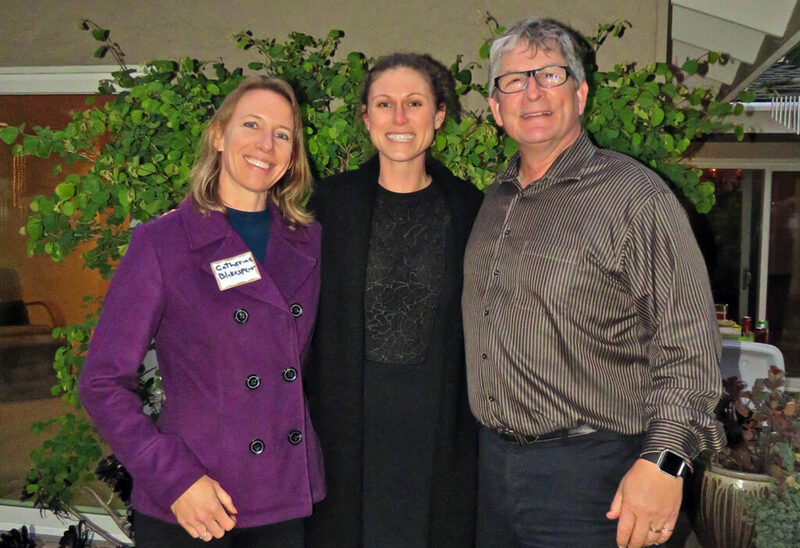 We recently honored outgoing Leucadia 101 Main Street Executive Director Carris Rhodes, who has done an outstanding job for the past four years. Here she’s congratulated by Deputy Mayor Tony Kranz (right) and me at a farewell party hosted by John and Elena Thompson. But the costs of running the city are also increasing, of course. Our contract with the Sheriff’s department is going up by 5.7%, an additional $761,000 on top of the $13.6 million we already pay yearly. We’ll be receiving the same services that we currently do but with an increased cost, which is apparently predominantly based on the department’s rising pension obligations. While the economics of Encinitas are fundamentally strong, like every public agency, the city is also burdened by the rising costs of pension debt. We have to make an additional payment of $505,000 to the CALPERS pension fund in 2018/19 on top of the $5 million we annually contribute now toward our pension obligations. Our unfunded pension liability is about $40 million, and we’re about 80% funded. This compares to an average for public agencies of 70% funded, which means comparatively we’re doing well. Based on the CALPERS assumed rate of return of 7%, our yearly pension obligation will nearly double in five years, going from about $5 million now to $9.3 million in 2022/23. Later this fall, the finance department plans a deeper analysis of strategies for tackling this issue. Funded infrastructure projects. Some of these projects have been long-promised, are expected in the next two years based on Council direction, or are already under construction. These are only the highlights. We have lots of smaller projects, such as $1.5 million in various drainage improvements. The largest capital expenditure category is “Streets and Rail” with a total project budget of $30.5 million. And built into our operating budget are increases in some city services. For example, we are now cleaning public bathrooms at parks, beaches and city facilities twice a day instead of just once a day. We are cleaning the downtown sidewalks more frequently; and we’re going to organically manage four more parks – Sun Vista, Mildred MacPherson, Hawkview and Las Verdes – in addition to Glen Park, which was our pilot project. The Finance Department will make changes to the proposed budget based on Council comments at our last meeting and return to us for review and possible adoption on June 28. Here are links to Encinitas Advocate and San Diego Union-Tribune stories about our budget process. 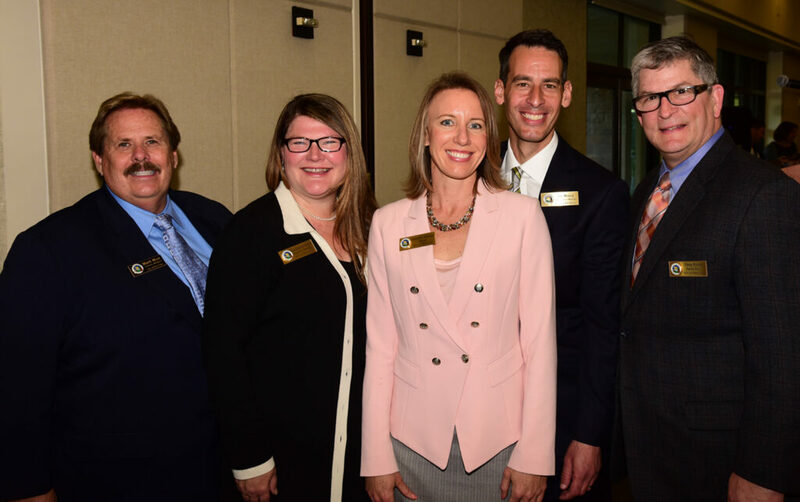 Your Encinitas City Council at our State of the City event earlier this year. (l. to r.) Council members Mark Muir, Tasha Boerner-Horvath, me, Joe Mosca, and Deputy Mayor Tony Kranz. In a complex, but thankfully collaborative process, the city’s five elected decision-makers really pulled together at the Council meeting last week to do this budget analysis and discussion. Our trust in each other allows us to be a highly functioning board, with a minimum of disharmony and ill-will, even when we see things differently. Budgeting can be an ordeal, but I left our meeting with a warm feeling about my colleagues and our professional staff, who masterfully researched and clearly presented lots of complex data. We shared a genial spirit of working together. Three weeks ago, the Coastal Commission rejected our request to place the rail trail in Cardiff on the west side of the railroad tracks. Instead, they issued a final ruling decreeing that the trail will remain east of the tracks. Reduce the overall size and footprint from 17 total feet to something smaller, preferably 10 feet in width. Build the rail trail with a material that is more natural than concrete or asphalt, such as emulsified/compacted decomposed granite. Move the required 4-foot post-and-cable fence as close to the railroad tracks as possible to allow our informal trails to remain. The requests appeared to be well received, and I’ll keep you updated. 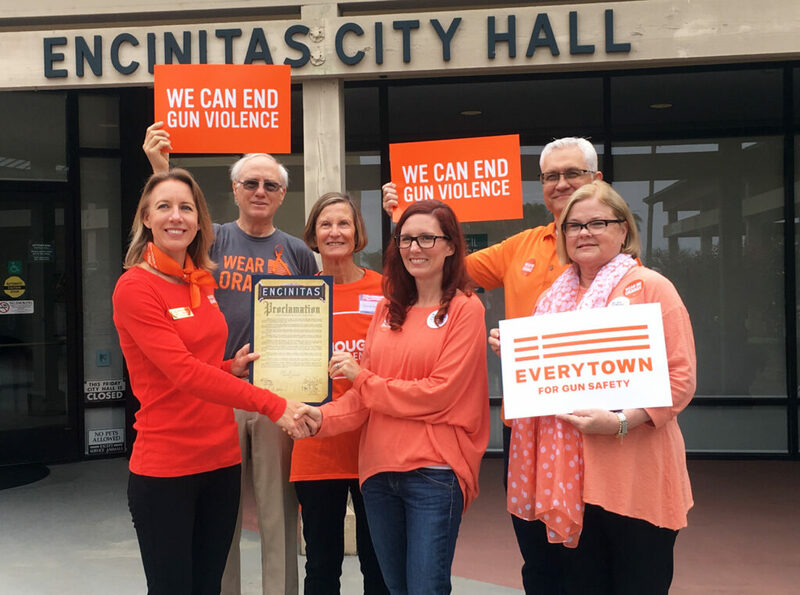 I was happy to present a proclamation to announce June 2 as Gun Violence Awareness Day in Encinitas. The proclamation is aimed at raising awareness about keeping firearms out of the wrong hands and encouraging responsible gun ownership to keep children and all citizens safe. Americans are 25 times more likely to be killed by a gun than people in other developed countries. Protecting public safety is a mayor’s highest responsibility.